Three Enduring Mysteries of Saturn’s Titan –Solved! Saturn's largest moon, Titan, is an intriguing, alien world that's covered in a thick atmosphere with abundant methane. With an average surface temperature of a brisk -297 degrees Fahrenheit (about 90 kelvins) and a diameter just less than half of Earth's, Titan boasts methane clouds and fog, as well as rainstorms and plentiful lakes of liquid methane. It's the only place in the solar system, other than Earth, that has large bodies of liquid on its surface. The origins of Titan's methane clouds and fog, as well as rainstorms and plentiful lakes of liquid methane have been a puzzle to scientists. Now, researchers at the California Institute of Technology (Caltech) have developed a computer model of Titan's atmosphere and methane cycle that, for the first time, explains many of these phenomena in a relatively simple and coherent way. The new model explains three baffling observations of Titan. 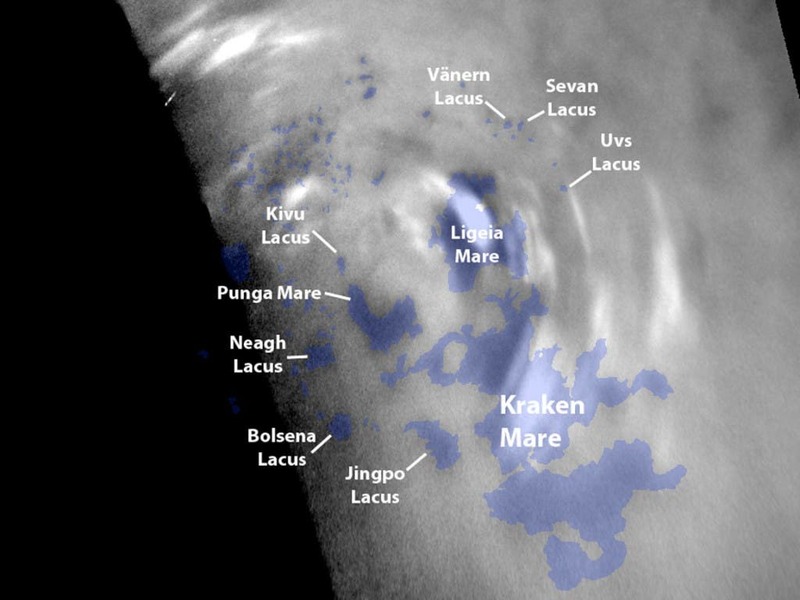 One oddity was discovered in 2009, when researchers led by Caltech professor of planetary science Oded Aharonson found that Titan's methane lakes tend to cluster around its poles—and noted that there are more lakes in the northern hemisphere than in the south. Secondly, the areas at low latitudes, near Titan's equator, are known to be dry, lacking lakes and regular precipitation. But when the Huygens probe landed on Titan in 2005, it saw channels carved out by flowing liquid—possibly runoff from rain. And in 2009, Caltech researchers discovered raging storms that may have brought rain to this supposedly dry region. Finally, scientists uncovered a third mystery when they noticed that clouds observed over the past decade—during summer in Titan's southern hemisphere—cluster around southern middle and high latitudes. Scientists have proposed various ideas to explain these features, but their models either can't account for all of the observations, or do so by requiring exotic processes, such as cryogenic volcanoes that spew methane vapor to form clouds. The Caltech researchers say their new computer model, on the other hand, can explain all these observations—and does so using relatively straightforward and fundamental principles of atmospheric circulation. In Image above the Cassini spacecraft chronicles the change of seasons as it captures clouds concentrated near Titan's equator. This picture consists of an average of three images taken using a filter sensitive to near-infrared light, which 'see' through Titan's haze to its surface and lower atmosphere, plus an image in visible light. "We have a unified explanation for many of the observed features," says Tapio Schneider, the Frank J. Gilloon Professor of Environmental Science and Engineering. "It doesn't require cryovolcanoes or anything esoteric." Schneider says the team's simulations were able to reproduce the distribution of clouds that's been observed—which was not the case with previous models. The new model also produces the right distribution of lakes. Methane tends to collect in lakes around the poles because the sunlight there is weaker on average, he explains. Energy from the sun normally evaporates liquid methane on the surface, but since there's generally less sunlight at the poles, it's easier for liquid methane there to accumulate into lakes. But then why are there more lakes in the northern hemisphere? 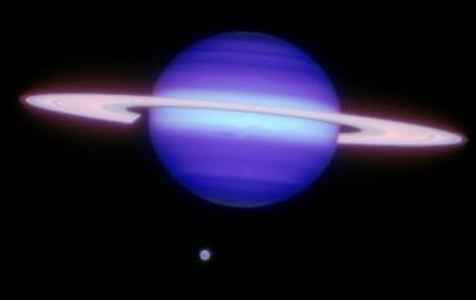 Schneider points out that Saturn's slightly elongated orbit means that Titan is farther from the sun when it's summer in the northern hemisphere. Kepler's second law says that a planet orbits more slowly the farther it is from the sun, which means that Titan spends more time at the far end of its elliptical orbit, when it's summer in the north. As a result, the northern summer is longer than the southern summer. And since summer is the rainy season in Titan's polar regions, the rainy season is longer in the north. Even though the summer rains in the southern hemisphere are more intense—triggered by stronger sunlight, since Titan is closer to the sun during southern summer—there's more rain over the course of a year in the north, filling more lakes. In general, however, Titan's weather is bland, and the regions near the equator are particularly dull, the researchers say. Years can go by without a drop of rain, leaving the lower latitudes of Titan parched. It was a surprise, then, when the Huygens probe saw evidence of rain runoff in the terrain. That surprise only increased in 2009 when Schaller, Brown, Schneider, and then–postdoctoral scholar Henry Roe discovered storms in this same, supposedly rainless, area. No one really understood how those storms arose, and previous models failed to generate anything more than a drizzle. But the new model was able to produce intense downpours during Titan's vernal and autumnal equinoxes—enough liquid to carve out the type of channels that Huygens found. With the model, the researchers can now explain the storms. "It rains very rarely at low latitudes," Schneider says. "But when it rains, it pours." The new model differs from previous ones in that it's three-dimensional and simulates Titan's atmosphere for 135 Titan years—equivalent to 3,000 years on Earth—so that it reaches a steady state. The model also couples the atmosphere to a methane reservoir on the surface, simulating how methane is transported throughout the moon. The model successfully reproduces what scientists have already seen on Titan, but perhaps what's most exciting, Schneider says, is that it also can predict what scientists will see in the next few years. For instance, based on the simulations, the researchers predict that the changing seasons will cause the lake levels in the north to rise over the next 15 years. They also predict that clouds will form around the north pole in the next two years. Making testable predictions is "a rare and beautiful opportunity in the planetary sciences," Schneider says. "In a few years, we'll know how right or wrong they are. 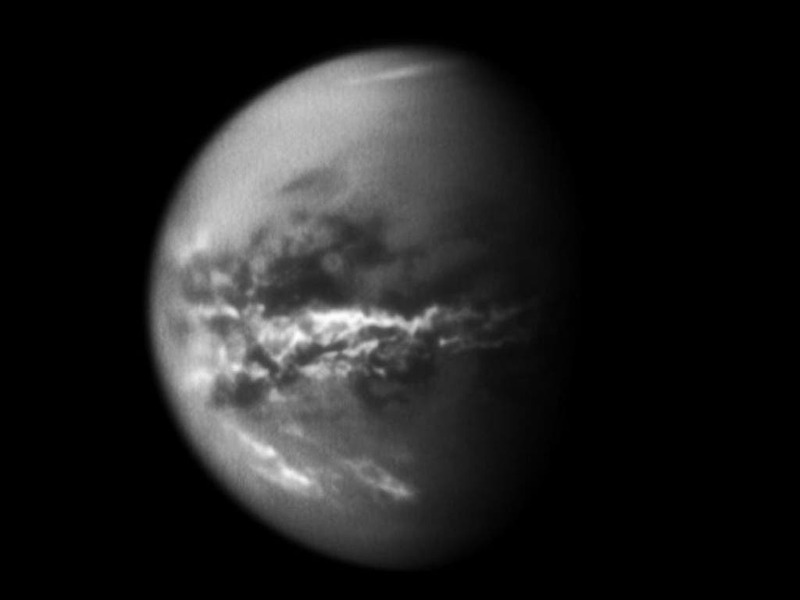 In the image below, April showers on Titan have brought methane rain to its equatorial deserts, as captured by NASA's Cassini spacecraft. This is the first time scientists have obtained evidence of rain soaking Titan's surface at low latitudes.